The Canadian World Parrot Trust is a branch of the World Parrot Trust the only international conservation organization devoted exclusively to the survival of parrot species in the wild, as well as the welfare of every individual parrot. Aware that people of every culture respond with affection to these beautiful and animated birds, the Trust sees parrots as ecological "pathfinders," leading the way to a wider understanding of conservation issues. The Canadian World Parrot Trust was officially granted charitable status in Canada in June of 1992, and is working in full support of Zoo de Beauval goals and objectives including funding vitally important parrot conservation projects both in countries where parrots originate, and at home in Canada. The Trust publishes an excellent quarterly newsletter, PsittaScene, edited by Ms. Rosemary Low, one of the world's foremost parrot authorities. Articles review global parrot issues and progress in parrot conservation. PsittaScene also helps the reader develop an appreciation of the challenges facing conservation today. Parrots have long been valued for their beauty, their exceptional intelligence and their ability to speak. This has not always been to the parrots' advantage. Today, many species have nearly vanished, reflecting the human damage inflicted on their tropical homes. Aviculture has a vital role to play in preserving the parrot species. The task of preserving the well being of the global parrot family is monumental. Our future success depends on avicultural and conservation groups working together, to ensure that future generations can enjoy the companionship of a feathered friend and to know that they can witness parrots flying free against the skies of their native land. If we miss the opportunity, there is no second chance. Parrots in captivity have enriched our lives. They have given us love, companionship and beauty. 50 million parrots worldwide are kept as pets. Should we not give them something in return? any other means that may be appropriate. "If man can save the parrots, he may yet save himself"
Published by The World Parrot Trust on behalf of many millions of parrot aviculturists and pet owners worldwide, and despatched to the appropriate authorities in every major country where parrots live in the wild or are kept as pets or breeding birds. This manifesto will also be sent to relevant international bodies and institutions, and to the media. Comments are invited from interested parties. A brief history of aviculture This activity is almost as old as mankind itself. We have confined poultry, pigeons and other birds for domestic and commercial reasons, and kept songbirds and other caged birds in our homes. So the keeping of birds, often called 'aviculture', is by no means a modern development. Until the last thirty years, the hobby of bird-keeping centred on low-cost birds such as canaries, fancy pigeons, and domestic strains of budgerigar. What is comparatively new is the discovery that the successful breeding in captivity of some birds, primarily members of the parrot family, can provide a fascinating hobby that also brings a profit opportunity. This has caused a great expansion of interest in aviculture, and an increasing demand for the importation of wild-caught parrots into many prosperous societies. With the ready availability of air transport, large numbers of parrots were removed from the wild, reaching a peak in the years 1970 to 1990. Many species were put at risk, and not surprisingly this traffic was opposed by concerned nations and conservation bodies. All but two common species of parrot are now covered by CITES, the Convention on the International Trade in Endangered Species of Flora and Fauna. Together with national legislation and controls, this convention has gone some way to reduce this threat to the survival of parrots in the wild. Every aviculturist is a lover of nature, captivated by the beauty and character of the birds he or she keeps. The well-being of the birds themselves lies at the heart of the hobby, and the devotion of bird keepers to their charges is usually plain to see. To succeed in the captive breeding of exotic birds requires study, dedication, intelligence, persistence, a natural understanding of wildlife, financial investment, and endless hard work. For the majority of aviculturists today, it remains an enthralling and decent special interest, one that can last a life-time, and be shared with the family, friends and fellow enthusiasts. It is fortunate that within this community, as in any other group, there are a few individuals whose activities tarnish the reputation of the many. In the avicultural world there are some who are not genuinely concerned about the welfare of birds, and who are prepared to act illegally, either for profit or to satisfy the 'collecting mania' that can sometimes be seen. These are the smugglers, many of whom have recently been brought to justice. Aviculture disclaims these people. Thet are not representative of our community. We also reject those who fail to give adequate care to their birds, or who treat their fellow hobbyists unfairly. In recent years much progress has been made in the science of aviculture, and in particular the veterinary care of birds. Most aviculturists have the help of an expert avian vet, and there is a wealth of publications on every aspect of the hobby. What is more, many avicultural organisations now fund conservation projects for parrots in the wild, and these contributions will undoubtedly increase. When The World Parrot Trust was launched in 1989, one of its stated aims was to see the importation of wild-caught parrots for the pet trade replaced by aviary-bred birds. This aim was derided by some, and strongly opposed by some commercial elements. Now, however, virtually every individual and organisation in our field has accepted the correctness of that aim. Attitudes are changing fast, and illegality or excessive exploitation hold little attraction for aviculturist in general. The concept of ‘responsible aviculture', conceived and promoted by The World Parrot Trust, is gaining ground, encouraging high standards in aviculture practice, and the need to accept a degree of responsibility for the conservation of wild populations, from which all captive birds have sprung. With our support groups in eleven countries around the world, we are able to detect a growing understanding of the need to improve the way aviculture is perceived, both by the general public and by regulatory authorities. In our opinion, this is a time for restraint in imposing further restrictions on ‘responsible aviculture'. Enforce CITES effectively in every country. Some countries have yet to join the convention, while others have signed up to CITES but do not implement it effectively. Use CITES to stop the mass importation of birds into developed countries. Large numbers of parrots are still being exported from Africa, Asia and Latin America. Ensure that legal trade is sustainable, and has regard for avian welfare. Ensure that departments responsible for wildlife regulation act efficiently. In some countries unreasonable delays occur in processing documents. Do not create new difficulties for aviculture. Most aviculturists are simple hobbyists, not major entrepreneurs. Do not burden them with unnecessary paperwork. Recognize and reward their contribution to parrot conservation, as continuing success in aviary-breeding reduces the demand for wild-caught birds. Continue efforts to combat illegal activities. No responsible aviculturist condones illegal activities of any kind, or examples of cruelty or incompetence in the keeping of birds. Aviculturists are very approachable people, and there are a number of organizations that represent them will. Please consult with them, and arrive at practical solutions that will ensure the long-term health of this commendable hobby. Summary: Aviculture is an ancient and natural human pastime which gives pleasure to millions of people. This fulfilling hobby has been compromised by the actions of a small minority. The World Parrot Trust (WPT) was launched in 1989 to work for the conservation of parrots in the wild, and their welfare in captivity. In its early years it concentrated on field conservation projects in parrot range countries, hut more recently it has become aware of the major welfare problem that exists with the millions of captive parrots in the developed world. Many parrots are bought on a whim, perhaps as a 'prestige pet' The purchaser may have no comprehension of the complex needs of a parrot, and will not realize the implications of taking on an animal that may live four times as long as a cat or dog, and will need as much care and attention as a human infant, but for perhaps forty years. In time, when the size of the commitment sinks in, the owner may neglect or even abuse the bird. At that point it may be sold on, given away, or offered to a parrot rescue organization. It has to be said, of course, that some parrots that have been kept in satisfactory conditions may have to be taken on by others, due to the age or ill-health of their owners. What is the scale of the problem? The World Parrot Trust, with the help of the MORI poll organization, found that there were in excess of 600000 large parrots (excluding budgies) in the UK in 1990. Extrapolating that figure on a population basis suggests that there are at least 3 million parrots in the US, although we are advised that the total may be nearer to 5 million. Globally the total can be estimated at 50 to 60 million captive parrots, since these birds are as popular as pets in their countries of origin as they are in the rest of the world. In time it may be possible to create an international education campaign to improve the lot of pet birds, but in the meantime we should try to address the problem in our own back yard. Paradise Park, in Cornwall UK, where the WPT is based, has been taking in unwanted parrots for twenty years, but is now full to capacity as are most zoos and bird parks. We know of many parrot rescue groups in the UK, USA, Benelux, Germany, Italy and other countries. These groups vary greatly in size, style, and methods, but what they have in common is a serious shortage of funds. The great majority of these groups are set up by genuine parrot lovers who recognise the problem and the need for action, and are able to fund the work themselves, or with the help of like-minded friends. Their work is likely to be limited by shortage of funds, space, time, or all three. If we return to the numbers of parrots needing rescue, we can start by noting our experience in the UK, which is supported by input from avian vets. We believe that as many as 30% of all pet parrots are seriously neglected. Inadequate nutrition, cage-bound with no space to spread wings, no spraying, no branches to chew, insanitary conditions, no veterinary support. This is based on visits to homes all over the UK, and no doubt will apply in other countries. This results in about 200000 cases of neglect in the UK, I to 1.6 million in the US, and as many as 20 million worldwide. From the practical point of view it is fortunate that not all these unfortunate birds will be offered for rescue at the same time. In the UK there may be 20 rescue centres, each handling an average of 100 parrots in a year. If this guesswork is at all accurate, this means that about 2000 parrots are rescued' in the UK each year. But that meets only 1% of the need. If, in the US, there are 100 rescue groups handling 100 birds each year, this comes to 10000 parrots, or less than 1% of the birds in trouble. The reader will appreciate that many of our calculations are speculative, but we have to start somewhere. We would welcome information from informed sources in any country. What cannot be denied is the sheer scale of the problem. There is no likely source of funds that WPT is aware of, that could even begin to meet the cost of this urgent animal welfare task. Individually, and as a 'movement', we can ask for help from companies and foundations associated with aviculture and the pet business, but this cannot be expected to solve the problem. Our conclusion at this point is that the rescue groups will continue to do their best for the parrots and will relieve much suffering, but will be unable to cope with the majority of birds needing help. Support a complete ban on the trapping, trading and export of wild-caught parrots from their countries of origin, unless for approved breeding programmes. Voluntarily reduce the numbers of parrots being bred in captivity. The aim should be quality, not quantity. Educate potential new pet parrot owners, so that they properly understand the commitment they are making. Help rescue groups wherever possible, with funding and facilities. The point here is that an oversupply of parrots exists, and this leads to lower prices for the producer, and easier access to parrot ownership for people who may not be suitable owners. As well as trying to solve the many individual problems, we should address the structural faults in the world of parrots: too many wild-caught birds still reaching developed countries, to be added to too many aviary-bred birds. In these circumstances, is it unreasonable to propose that commercial objectives might be given less priority, in favour of welfare objectives? We must emphasise that the World Parrot Trust was founded and is run by aviculturists, and supports our hobby through thick and thin. Our 'Manifesto for Aviculture' was distributed internationally in February 1997 (write in if you would like a copy), and has had some effect in promoting the concept of 'responsible aviculture'. This responsibility surely includes caring for the parrots that become unsuccessful' pets and are condemned to miserable, unfulfilled lives. These are simply a draft for discussion, based on information supplied by rescue groups. We invite further input from all sources of expertise and opinion. Any group engaged in this task should ensure it has sufficient funding, wide experience of working with parrots, suitable accommodation, expert veterinary support, and sound methods of assessing foster homes. The motivation must be nothing other than the rescue, rehabilitation and longterrn welfare of the birds. The profit motive has no place in parrot rescue. Stability is vital. This means a total commitment on the part of the people involved, plus reasonable financial status. A business plan is recommended. Some expertise in public relations is important, to maximise publicity about parrots in difficulty, the rescue service available, and the need for funds and other forms of support. It is also important to work effectively with local parrot people, clubs, and authorities. The quality and range of facilities must be adequate. Separate quarantine, hospital, rehabilitation and pre-release sections are essential. Supervision at all stages by an avian veterinarian is strongly recommended. Re-homing of rehabilitated birds is a key element in the work of most rescue operations. This requires inspection of would-be foster homes, the education of those taking on responsibility for the bird, a document recording the precise commitment being undertaken, and effective follow-up to ensure that all is well. Integration of rehabilitated birds of endangered species into an EEP or other approved breeding project is recommended. When the World Parrot Trust began to support this species in 1990 it was the least numerous parrot in the world, with only about 15 individuals left in the wild and none in captivity. We began by supplying a 4WD vehicle (with help from the UK Parrot Society), and have provided research funds every year, to reach a current total of $10,000. For the past three years we have sent our trustee and veterinary consultant Andrew Greenwood to advise the team headed by Carl Jones of the Jersey Wildlife Preservation Trust. Working together with the Mauritian Wildlife Fund, they have raised the total number of Echo Parakeets to around 50. 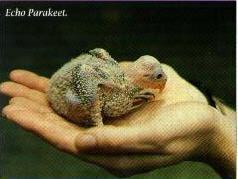 Of these, 17 are in the new aviary facility, and plans are in hand to begin releasing some back into the wild in 1996. This is probably the world's most successful parrot conservation programme. Since 1992 the World Parrot Trust has been supporting the work of Dr Charles A Munn lll, the world's leading expert on macaws. At one time, Lear's Macaw was thought to be reduced to only 50 or 60 specimens, living in a dry and desolate area of NE Brazil. These birds are threatened by a shortage of the palm trees on which they rely for food and this lead to our funding a longterm scheme to grow and transplant thousands of these trees. The other main threat is the trapping of these birds for sale to unscrupulous collectors. Dr Munn, with his Brazilian colleagues in the area, has made substantial progress in converting trappers to macaw protectors. His team has also discovered the nesting cliffs of an entirely new population of Lear's Macaw, a very welcome development (see our PsittaScene newsletter for November 1995). This project was proposed to us in 1991 by Joseph M Forshaw, renowned author of 'Parrots of the World'. It concerns an endangered sub-species of the Red-tailed Black Cockatoo which occurs in a limited area in the South of Australia. This population is reduced to between 500 and 1000 birds and it is threatened by trapping for the bird trade and by a shortage of suitable nest trees. Its food trees are also in short supply. Our funding of AUS$5000 each year for five years has resulted in additional finance coming forward from State sources; these have been used to employ a local farmer to record, study and protect nest sites and encourage local residents to value and hepl preserve these magnificent birds. Our involvement with this most beautiful of parrots goes back many years. In 1974 Paradise Park (home of the World Parrot Trust) was sent a pair of these birds by the St Vincent Government. The park has succeeded in breeding them and is sending offspring to members of the official St Vincent Parrot Consortium. In 1994 we were able to send one of our four Parrot Buses (created in partnership with Paul Butler of RARE Centre) to St Vincent, where it is used to educate the island's children about the importance of preserving the remaining rainforest, not just for the parrots, but to ensure the island's water supply. We have also sent Dr Andrew Greenwood to advise on the government's breeding programme for the St Vincent Parrot and we are in the process of building a new display avaiary in the famous Botanical Gardens in Kingstown. This cockatoo is now listed as 'Critical in BirdLife International's 'Birds to watch 2'. The total population may lie between 1000 and 4000, scattered among many islands. The destruction of its lowland forest habitat is a major concern, but trapping is probably the greater threat. Indeed, 'Birds to Watch 2' reports 'the young of every known accessible nest are taken for the pet trade'. Urgent action is needed and Marc Boussekey of Espace Zoologique, France, has been successful in setting up a conservation programme on Palawan, a remaining stronghold of the species. His partners there have established the Sagip Katala (Save the Cockatoo) Movement, and their members are protecting nest sites by providing incentives for ex-poachers and educatiing the local population through radio broadcasts. We have provided $2000 towards a total budget of $20000, so much more help is needed. Remember, this species is 'Critical', so please consider helping this project. A previous draft Parrot Action Plan has been discontinued due to differences of opinion between leading scientific experts. The World Parrot Trust took the initiative in making a new attempt at this task, so vital to the conservation of endangered parrot species. With the valuable help of British Airways Assisting Conservation, who provided flights worth $40000, a meeting of international parrot specialists was arranged in London in June 1995. This resulted in agreement to proceed with a new Action Plan, backed by IUCN, the World Conservation Union, Birdlife International, the Association for Parrot Conservation and the World Parrot Trust. We have been given the job of coordinating and progressing the Action Plan, which is to be completed by the end of 1996. We need $30000 for this, but so far we have only $5000 provided by ourselves, and $4000 from the Institut fur Papageienforschung. We would welcome further donations or pledges to complete the necessary funding. One of our original stated 'Aims' was 'to protect and preserve the natural habitats of parrots'. We now feel ready to start a special fund for this purpose. The PARROT HABITAT FUND uses a beautiful rainforest painting generously donated to the Trust by Cyd Riley of Firefly T-shirts. It carries the message 'Save it for the parrots, save it for us all!' We have established contact with a number of excellent habitat preservation projects involving parrots and details of these will be provided in our newsletter PsittaScene. Our hope is that this campaign and the T-shirts and other merchandise associated with it, will appeal to a wide general audience in addition to the 'parrot world'.